Suscr�base a las listas UCEMA y reciba por mail informaci�n actualizada de las actividades. 30/04 12:00 h Emilio Ocampo (UCEMA y New York University). Commodity Booms and the Populist Temptation. An Explanation of Argentina’s Decline in the 20th Century. Argentina’s economic and institutional decline has long posed a conundrum to economists and social scientists. In particular, it challenges modern theories that seek to explain differences in economic growth across countries. Theories that claim that institutions have a first-order effect on growth cannot explain the secular economic decadence of the most institutionally advanced country in Latin America. Theories that claim that that education precedes good institutions, cannot explain the institutional degradation of the most educationally advanced country in Latin America. Theories that claim that social capital is the determinant factor face an equally daunting problem. This paper emphasizes the key role played by recurrent cycles of populism in pushing the country into secular decadence. It explains these cycles in terms of the interaction of culture and institutions and posits that rising commodity prices are a signal of impending political change and can predict the ascent of populist regimes. La conferencia será dictada en castellano. 29/05 12:30 h Ricardo Crespo (Universidad Austral; Conicet). Happiness economics, eudaimonia and positive psychology: from happiness economics to flourishing economics. A remarkable current development, happiness economics focuses on the relevance of people’s happiness in economic analyses. As this theory has been criticised for relying on an incomplete notion of happiness, this paper intends to support it with richer philosophical and psychological foundations. Specifically, it suggests that happiness economics should be based on Aristotle’s philosophical eudaimonia concept and on a modified version of positive psychology’ that stresses human beings’ relational nature. First, this analysis describes happiness economics and its shortcomings. Next, it introduces Aristotle’s eudaimonia and takes a look at positive psychology with this lens, elaborating on the need to develop a new approach that goes beyond the economics of happiness: the economics of flourishing. Finally, the paper specifies some possible socio-economic objectives of a eudaimonic economics of happiness. Trabajo realizado en conjunto con Belén Mesurado (Centro Interdisciplinario de Investigaciones en Psicología Matemática y Experimental; Conicet). 05/06 12:00 h Juan Carlos de Pablo (UCEMA; UDESA; DEPABLOCONSULT). Nada es más fácil, para criticar una teoría, que inventar una versión absurda o utópica de la misma. Es lo que, desde hace mucho tiempo, ocurre con la denominada "teoría del derrame" ("trickle-down theory", en inglés). ¿Para qué ocuparse de la cuestión, entonces? Dice el Papa Francisco: “Algunos todavía defienden las teorías del 'derrame', que supone que todo crecimiento económico, favorecido por la libertad de mercado, logra provocar por sí mismo mayor equidad e inclusión social en el mundo. Esta opinión, que jamás ha sido confirmada por los hechos, expresa una confianza burda e ingenua en la bondad de quienes detentan el poder económico y en los mecanismos sacralizados del sistema económico imperante”. El enfático pronunciamiento papal es un buen pretexto para analizar si la teoría sirve en algún sentido, o es simplemente una estupidez que calma la conciencia de algunos seres humanos, dada la situación económica en la que viven otros seres humanos. Al mismo tiempo vale la pena analizar si el derrame es una realidad, aunque todavía no haya sido modelado apropiadamente. Consiguientemente este ensayo se divide en 2 partes, la primera dedicada a la teoría y la segunda a la realidad del derrame. 02/07 12:30 h Eric Arias (New York University). To what extent do international financial fluctuations influence patronage politics in developing countries? While many scholars have analyzed the sources of patronage and how it can be detrimental for both economic development and democracy, patronage politics has been analyzed as a purely domestic phenomenon. This ignores, however, the consequences of international markets fluctuations, and in particular, how they may impact the financial resources available to a politician. In this paper, I argue that patronage activities can be funded by borrowing funds from the credit market, and consequently, international financial markets exert an indirect influence on patronage politics. I test this argument by examining the effects of the plausibly exogenous U.S. Federal Reserve policy on patronage policies at the subnational level in Argentina and Mexico. Evidence shows that (i) politicians use public debt to fund their public employment spending, and that (ii) the extent to which they are able to do so is influenced by the international financial market. Substantively, a 1 percentage point decrease in the Fed interest rate leads to a 3.6% [95% CI: 1.4 - 5.8] increase in public employment spending in Argentina and a 2% [0.7 - 3.4] increase in Mexico. Finally, the analysis of a placebo test on public goods spending also supports the argument. 03/07 12:00 h Germán Coloma (UCEMA). Este trabajo propone un procedimiento para evaluar la posible existencia de correlación negativa entre complejidad fonológica, morfológica y sintáctica de diferentes idiomas. El procedimiento se basa en el uso de coeficientes de correlación parcial, variables instrumentales y sistemas de ecuaciones simultáneas, y se lleva a cabo sobre datos tomados de la fábula “El viento norte y el sol”, traducida a 40 idiomas distintos. La complejidad fonológica se mide por el número de fonemas por sílaba, la complejidad morfológica por el número de sílabas por palabra, y la complejidad sintáctica por el número de palabras por frase. Luego de controlar por fenómenos relacionados con factores geográficos y endogeneidad estadística, se llega a la conclusión de que la complejidad fonológica está negativamente correlacionada con la complejidad morfológica, y que esta, a su vez, está negativamente correlacionada con la complejidad sintáctica. Estos resultados pueden relacionarse con la llamada “ley de Menzerath”. 27/08 12:00 h Andrés Chambouleyron (Compass-Lexecon). In 2002, Argentina devalued its currency and froze public utility rates thus breaching the guarantees granted to investors the decade before. Those guarantees had lowered investors' cost of capital by substantially reducing expropriation risk. This paper looks into the governance structure chosen by Argentina for the privatization process and potential alternatives after a decade of contract breaches. Future governance should be market-oriented, involving vertically separated companies with former public utilities voluntarily acting as operating companies or OpCos, and NetCos in charge of all network expansions under the structure of PPPs created for such purposes. 16/09 12:30 h Hauke Hartmann (Senior Project Manager de la Bertelsmann Stiftung). The BTI measures the current state of democracy and market economy in a given country, its evolution over the past two years and the quality of governance performed by its leadership. Updated every two years, the Transformation Index BTI provides a ranking that combines qualitative, in-depth evaluations with quantitative scores for the performance of 129 developing and transition countries. The data collected will contribute to the development of strategy recommendations for the political management of transformation. Invitan la Maestría en Estudios Internacionales y el Departamento de Ciencias Políticas y Relaciones Internacionales. En Sede Central - Córdoba 374, CABA. 18/09 12:00 h Jorge M. Streb (Universidad del CEMA) y Fernando Tohmé (Universidad Nacional del Sur). We explore how some informative cheap-talk equilibria rely on out-of-equilibrium beliefs that can be interpreted as threats, or verbal signs, that are added to the priors of the game without communication. These equilibria are represented here instead as the consequence of bilateral communication using meaningful talk. This sharply restricts Bayesian updating, since the priors may only be affected by the verbal communication that is comprehensible and relevant to the game in question, and that is credible given the strategic context. This setup suggests a mechanism to explain how specific outcomes are selected. It also relates signaling and screening models. By the revelation principle, verbal messages are used to reveal types. Since linguistic signs do not provide direct evidence, uninformative equilibria are possible unless the screening mechanism is credible, i.e., there is a binding commitment to abide by it. 24/09 12:30 h Francisco Poggi (Universidad de San Andrés). I study a sequential two-player game of trust, where a first player has to decide whether to trust the other or not when the former might betray him. Parting from this social dilemma I wonder which types of preferences could survive under an evolutionary environment. I found that with imperfect observability of types, a stable and heterogeneous equilibrium might arise with both reliable and opportunistic individuals. The results are in line with some stylized facts in the experimental literature. 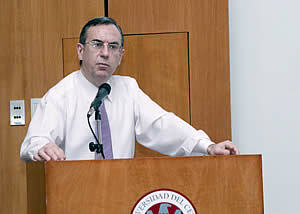 02/10 12:30 h Edgardo Zablotsky (UCEMA). Vouchers educativos. ¿Por qué no considerarlos? George Stigler dijo alguna vez que su objetivo era mejorar la comprensión del mundo y el de Milton Friedman cambiarlo. Por ello, no es de extrañar que en 1996 haya fundado la Friedman Foundation for Educational Choice, dedicada a promover su pionera propuesta sobre la conveniencia que los padres puedan ejercer la libertad de elegir la escuela a la que concurrirán sus hijos, independientemente de sus posibilidades económicas. En este seminario recordaremos la idea original propuesta por Friedman en 1955, ilustraremos su actualidad mediante evidencia de otras sociedades, y sustentaremos su conveniencia y factibilidad frente a la crisis educativa que enfrenta nuestro país. 15/10 12:30 h Oscar Bajo Rubio (Universidad de Castilla-La Mancha). The factors influencing the real exchange rate are an important issue for a country’s price competitiveness, which is especially relevant to those countries belonging to a monetary union. In this paper, we analyse the relationship between fiscal policy and the real exchange rate for the case of Spain. In particular, we explore how changes in government spending, differentiating between consumption and investment, can affect the long-run evolution of the real exchange rate vis-à-vis the euro area. The distinction between two alternative definitions of the real exchange rate, based on consumption price indices and export prices, respectively, will also prove to be crucial for the results. 31/10 12:30 h Lucas Ronconi y Rodrigo Zarazaga (Centro de Investigación y Acción Social -CIAS-). Governments in new democracies launch social policies with the purported goal of alleviating the effects of poverty among the most vulnerable households, usually low income families with children. However, because the politicians who decide on these policies seek to maximize political support and because children do not vote, this goal is often thwarted by the clientelistic distribution of social policies' benefits. Based on the main Argentine household survey and on personal interviews with 120 brokers, this paper shows that brokers collect information on family size and age composition and allocate workfare programs discriminating against families with children not old enough to vote.